Calling all teachers and parents: If you are looking for a spring craft that is super easy to make, then this one is for you! Celebrate spring and nature with your kids by making a paper bird nest craft. This design is so easy to construct that even a preschooler will have no problems with this crafty project. No artistic skills are necessary! All you have to do is cut, paste and paint. The hardest part is waiting for the paper nest to dry in between steps. Use this beautiful craft as a stepping point to promote discussion about birds, nature, and spring.You could also discuss recycling and protecting our earth when assembling this art project. This craft also works well for the Easter holiday. You could add decorated Easter eggs instead of the painted wooden eggs to the nest adding a festive touch. Cut brown paper grocery bags, lunch bags or kraft paper into thin strips. You can do this with scissors, or you can run the paper through an old fashioned paper shredder if you happen to have one on hand. Crumple the paper strips into a ball. Wrap your bowl with clear plastic wrap. Make sure to wrap both the top and bottom of the bowl with plastic to protect it from glue. Place some newspaper or a plastic sheet onto your work surface to protect it from glue. This step is the right time to put on those latex gloves. They are not necessary but sure do come in handy with you are working with Mod Podge! Turn your covered bowl over so that it is bottom side up. Pour some Mod Podge into an old plastic container that you can throw away later. Dip the paper strips into the craft glue. Make sure that you cover all areas of the paper strips with the craft glue. Place the paper pieces onto the bottom of the plastic covered bowl scrunching the paper strips as you go. Cover the entire bottom of the bowl with the crumpled paper strips. Allow the paper strips to dry for 24 hours. After 24 hours the nest should be dry. Gently remove the paper nest from the bowl. Remove the clear plastic wrap from the paper nest. Every nest needs some eggs! Cover your work surface again with old newspapers or protective plastic sheets. Make sure your child has an apron or old tee shirt on to protect their clothing, then let your budding artist get creative! 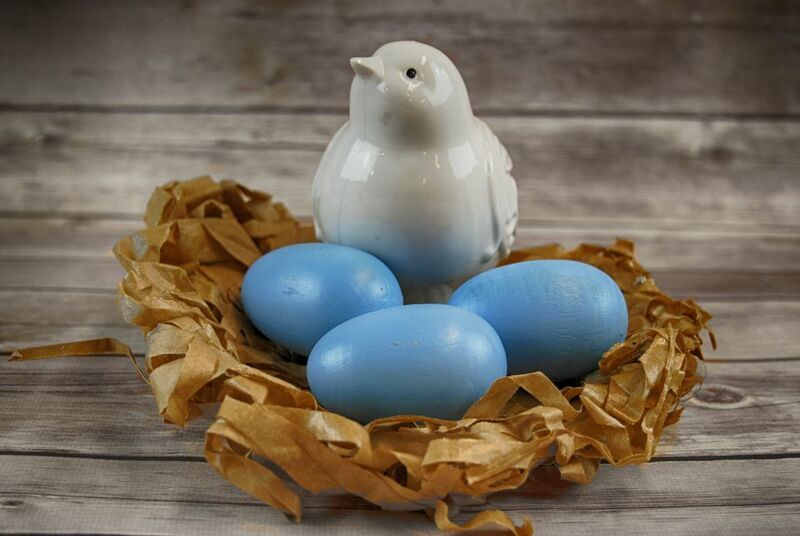 Paint the wooden eggs with baby blue colored craft paint. You may have to paint the top half first, then let it dry. Cover the bottom portion of the wooden egg with paint and let it dry. The craft paint should be dry to the touch after about one and a half hours. Place your painted eggs into the paper bird nest. If you have one, attach your artificial bird to the paper bird nest next to the eggs.